A new bed (we have changed hotel to something rather more salubrious in Orange); too much heavy food. I don't know, but I slept uneasily and woke wishing it were earlier. Thoughts of our first tasting pulled me from my bed, my heels not dragging too much, motivated, as they were, by our first appointment: Clos des Papes. This is one of the foremost estates of this outstanding appellation; Wine of the Year was their 2005 vintage in Wine Spectator magazine last year; most burgundian of Ch9s (as many tasters foreshorten it in their notes). There are records of the Avril family in Châteauneuf dating back to the mid-18th century. 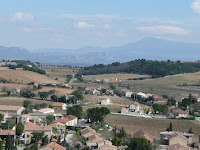 If anyone's going to understand what's going on in the appellation it's Vincent, scion of that long line of wine makers. Vincent is a big chap. He speaks English fine, but will lapse into it only if he thinks you're in trouble. He knows huge numbers of people in wine around the world and, indeed, during our tasting his mobile sounds and he answers a call from one of the Carillon family in Puligny-Montrachet. He spends some time waxing about the bottle of '95 Puligny 1er Cru Clavoillon he consumed the evening before. Gone are the days (I am happy to say) when French wine makers drank nothing but the wine from their own region. Vincent has a cellar stretching to some 4,000 bottles from around the world. This is what happens when people dig your hooch. The Delon family at Léoville-Lascases swap, each vintage, on a like-for-like basis. Vincent has some 60 cases of wine from that château in his cellar. No wonder he seems chuffed! We taste his 2006, or, at least, we taste bits of it. It has yet to be assembled and we are offered samples of the constituent parts: one a Grenache/Mourvèdre cuvée from clay soils; another a Grenache/Mourvèdre cuvée from sandy soils; yet another a pure Grenache, old vine wine. I cannot describe each here and it's enough to say that the '06 will be magnificent. We are late for St Préfert. Vincent keeps us too long. And yet it doesn't seem to matter. We have the impression that Isobel might have lost sight of our rendezvous. "I am never stressed," she tells us. And we can believe it in someone so energetic; someone so tickled at being part of a domaine making such fine wine waves. Her wines are lovely, as is she. She smiles, we smile. We taste, she tastes. Such mouthfuls, like food and drink combined: pure and complex and very, very satisfying. We repair to Châteauneuf for lunch (good bottle of 2006 Moulin Tacussel Blanc) and then head to nearby Courtézon and a new domaine to me: Cristia. Typically Cristia, until recently, sold all its wine in bulk to negoçiants and it is only through a generation change that new life has been breathed. Three vintages; three wines. We are reeling. The canvas of our palates has been splashed with flavour as if by Jackson Pollock. We hurry on. Last stop is Giraud, a domaine Bowes Wine has been following over the last few vintages as the quality has stepped up into the firmament. 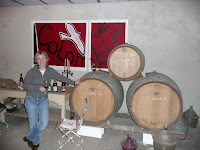 Marie makes the wine and is the first ever fully qualified female wine maker in Châteauneuf. '06 is the best ever vintage here and we are shocked by the quality. Purity, concentration, complexity. The recipe is written. Make no mistake; Châteauneuf is riding high. Fine wine emanates from here; rich wine and complex with it. A renaissance is occurring. Savvy buyers know that the time is now.